Many colored blooms on Blushing Bride. Hydrangeas could be called the great, morphing flower. From the time they bloom in June and July until Fall arrives, the flowers undergo amazing and wondrous changes. 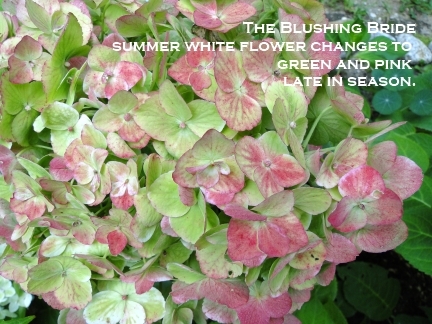 My white flowering “Blushing Bride” is showing some unusual color combos as it ages. The once all-white huge flower is now mostly green with some pink on each petal. On the same bush, I have a white flower that seems to be changing to light blue, and some smaller, light green blooms. 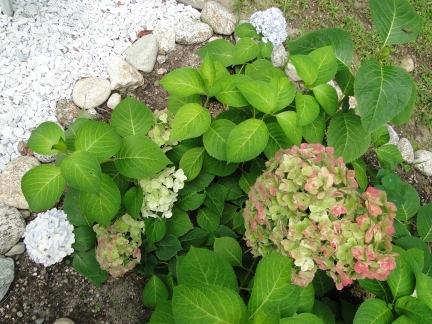 By this time of year, late summer, any hydrangea shrub which had held bright blue flowers now has odd-colored blooms that no longer resemble the pretty blue. It’s not really a bad thing, but the coloring is a bit hard to categorize. It’s a combo of green, purple, pink and maybe some blue tint still left. I suppose it depends on your garden dirt. That is the thing about hydrangeas. They are never dull. Even as they age they can still be very interesting and lovely.